Amazon Web Services on Wednesday pledged to enhance cooperation with its South Korean partners with a focus on the finance industry. 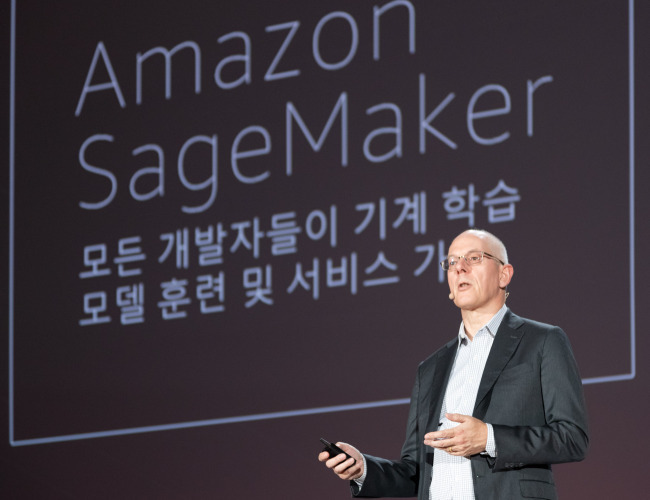 With the South Korean government easing regulations on cloud computing businesses in the financial sector this year, AWS said at its annual meeting in Seoul that it is seeking to lead the charge by expanding into the new market. Financial institutions here had been banned from storing clients’ personal data on cloud service platforms. The restriction was lifted in January to allow for keeping information related to identification and financial credits. “As we see improvements in financial regulations, we expect cloud platforms to expand in the financial industry,” Jang Jung-wook, managing director of AWS Korea, said during his speech at the conference. Adrian Cockcroft, vice president of Cloud Architecture at AWS, echoed the remarks. Describing AWS’ business in South Korea as “very successful,” Cockcroft touted AWS’ capability to store massive data without security breaches. He stressed that Amazon became the first “certified” cloud service provider in Korea upon receiving Information Security Management System certificate in 2017. ISMS certification is given to companies that pass a government test for information protection. Cockcroft also stressed that AWS is faster than competitors in transferring data. With its DataSync service, users can transfer data about 10 times faster than when they use open-source platforms, he said. The AWS Summit Seoul 2019 is one of the biggest cloud services events in Korea. About 22,000 people and 60 partner companies participated in the event to share their business experiences in using AWS services.